Access4Patients - operated by NuMeds Services Ltd - announces that it has successfully enabled the first patient in the UK to legally obtain a private prescription for medicinal cannabis to be dispensed in the UK. United Patients Alliance Ltd - announces collaboration and support for Access4Patients - operated by NuMeds Services Ltd. The disclosure form is an opportunity for you or your family member to disclose how you find Cannabinoids help you manage your medical condition. The aim is to help practitioners understand patient experience and to help them make a clinical decision on which type of prescribable product would be appropriate for you in future. United Patients Alliance are aware that there are thousands of people in the UK who feel that supplementing their intake of cannabinoids, especially with maximised proportions of CBD is beneficial for their health and well-being. 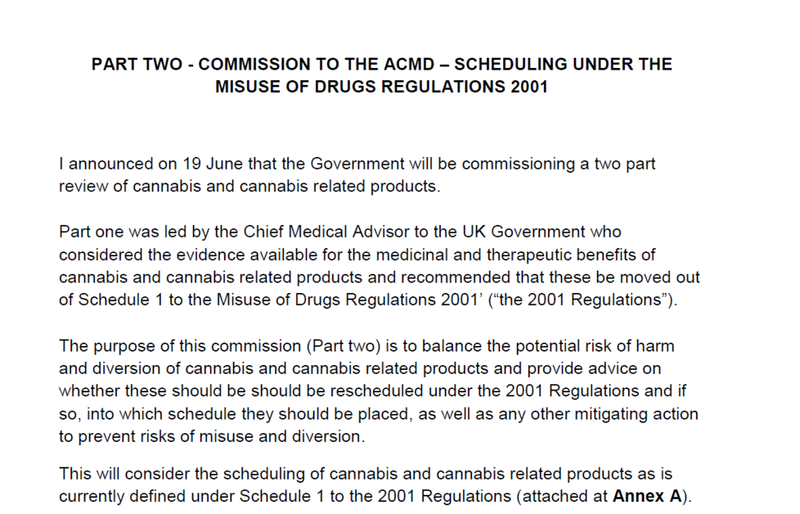 This is a long overdue and historical day for medical cannabis in the UK. Many years of tireless campaigning for legal access to cannabis therapeutics has finally had an impact. On behalf of all patients we would like to thank the Home Secretary, Sajid Javid, for opening the door to cannabis medicine so quickly. Tonight ITV will air the premiere of their new programme “gone to pot” the show features some well known faces to the British public and is an interesting look into how cannabis can effect different people. Re-newed thanks for your support on my 10 minute rule bill. I tend to be over optimistic but having had my last proposed bill adopted by Government I am hopeful that a change in Government attitudes is taking place. UPA - Medical Cannabis conference & AGM. United Patients Alliance - Annual general meeting - 30th September, Birmingham. On August 17, 2017, the German cannabis expert Franjo Grotenhermen entered an indefinite hunger strike. The objective of refusing to accept any food is to decriminalize all citizens who need cannabis to treat their serious diseases.